Check out Tobi's Philipa Belted Jumpsuit We're getting serious safari vibes from Tiger Mist's Philipa Tan Belted Jumpsuit and we can't get enough of it. This plunging v-neck jumpsuit features rolled-up short sleeves, a front zipper, a belt, and wide legs. Pair this belted jumpsuit with tiny sunglasses and mules for a chic outdoor look. 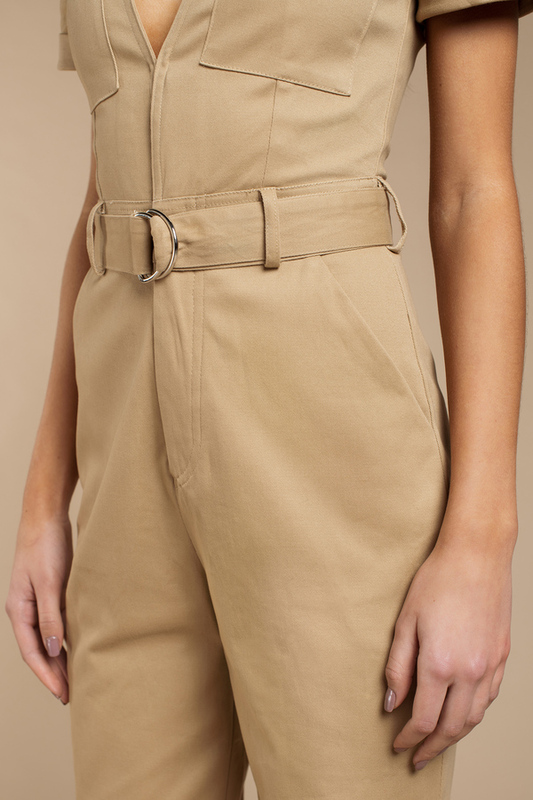 We're getting serious safari vibes from Tiger Mist's Philipa Tan Belted Jumpsuit and we can't get enough of it. This plunging v-neck jumpsuit features rolled-up short sleeves, a front zipper, a belt, and wide legs. Pair this belted jumpsuit with tiny sunglasses and mules for a chic outdoor look.